This is a three-part blog post series about how organizations are using Azure Cosmos DB to meet real world needs, and the difference it’s making to them. In part 1, we explored the challenges Skype faced that led them to take action. In this post (part 2 of 3), we examine how Skype implemented Azure Cosmos DB to modernize its backend infrastructure. In part 3, we’ll cover the outcomes resulting from those efforts. Geo-replication: The team started by deploying Azure Cosmos DB in one Azure region, then used its pushbutton geo-replication to replicate it to a total of seven Azure regions: three in North America, two in Europe, and two in the Asia Pacific (APAC) region. However, it later turned out that a single presence in each of those three geographies was enough to meet all SLAs. To meet the solution’s audit history requirements, developers implemented an event sourcing with capture state pattern. Instead of storing just the current state of the data in a domain, this pattern uses an append-only store to record the full series of actions taken on the data (the “event sourcing” part of the pattern), along with the mutated state (i.e. the “capture state”). The append-only store acts as the system of record and can be used to materialize domain objects. It also provides consistency for transactional data, and maintains full audit trails and history that can enable compensating actions. Developers used the Command and Query Responsibility Segregation (CQRS) pattern together with the event sourcing pattern to implement separate write and read paths, interfaces, and data models, each tailored to their relevant tasks. “When CQRS is used with the Event Sourcing pattern, the store of events is the write model, and is the official source of information capturing what has happened or changed, what was the intention, and who was the originator,” explains Kaduk. “All of this is stored on one JSON document for each changed domain aggregate—user, person, and group. The read model provides materialized views that are optimized for querying and are stored in a second, smaller JSON documents. This is all enabled by the Azure Cosmos DB document format and the ability to store different types of documents with different data structures within a single collection.” Find more information on using Event Sourcing together with CQRS. 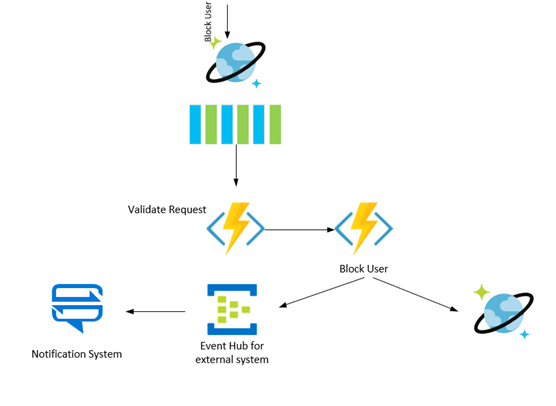 Instead of using Azure Functions to handle change feed processing, the development team chose to implement its own change feed processing using the Azure Cosmos DB change feed processor library—the same code used internally by Azure Functions. This gave developers more granular control over change feed processing, including the ability to implement retrying over queues, dead-letter event support, and deeper monitoring. The custom change feed processors run on Azure Virtual Machines (VMs) under the “PaaS v1” model. Similarly, developers used change feed to support integration with other services, such as notification, graph search, and chat. The event is received on background by all running change feed processors, one of which is responsible for publishing a notification to external event consumers, such as Azure Event Hub, using a public schema. 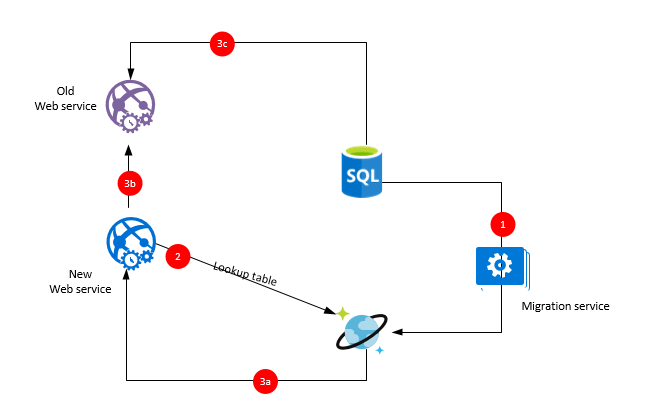 Query the data in SQL Server and transform it into the new data models for Azure Cosmos DB. Insert the data into Azure Cosmos DB and mark the user’s address book as mastered in the new database. Update a lookup table for the migration status of each user. To make the entire process seamless to users, developers also implemented a proxy service that checked the migration status in the lookup table for a user and routed requests to the appropriate data store, old or new. After all users were migrated, the old PCS service, the lookup table, and the temporary proxy service were removed from production. Migration for production users began in October 2017 and took approximately two months. Today, all requests are processed by Azure Cosmos DB, which contains more than 140 terabytes of data in each of the replicated regions. The new PCS service processes up to 15,000 reads and 6,000 writes per second. A process monitors that RU usage scales allocated RUs as needed. Continue on to part 3, which covers the outcomes resulting from Skype’s implementation of Azure Cosmos DB.